Sticking up for Berastagi, Sumatra. | IKIMASHO! Sticking up for Berastagi, Sumatra. A quiet town with not much going on. But that’s exactly why you should go. The picture above is one of my favourite photos, taken down a quiet street in the town of Berastagi in north Sumatra. There’s nothing spectacular about its content, but I remember the moment very clearly – a group of kids playing just down the road from the house I was staying in. Berastagi is visited by many travellers who use it as a base to climb Sibayak, though no one actually bothers to stay in the town for any extended period: 24 hours max seems to be the norm, with most not even choosing to sleep. It’s a shame, because while Berastagi may not offer much, that’s exactly where lies its appeal. It’s a sleepy town where horses share the streets with old beat-up American cars; where you can buy grilled, spicy corn husks and sit and watch the world go by. Visiting a place like this – and choosing to stay with a local family – is a great way to experience how people live in the region. Arrival in Berastagi. The active volcano of Sibayak makes for an imposing backdrop, with sulphuric fumes and low-lying cloud. At 1,300 metres above sea level, Berastagi is situated on the crossroads of the main route linking the Karo highlands of Northern Sumatra to the coastal city of Medan. As always, I try to stay with a local family whenever possible. For the life of me I can’t remember my host’s name but she was so, so nice – constantly walking about the house puffing on a clove cigarette. She made food in the morning and told me I could eat as much of it as I wanted throughout the day, and her son played me demos of the black metal band he had just started. Please, please stay in homestays when you travel. There is significantly more industry in the Berastagi subdistrict than the rest of Karo Regency – aided by the fact that Berastagi has 100% paved roads. Horses, however, still make up part of the traffic, particularly around the market area. 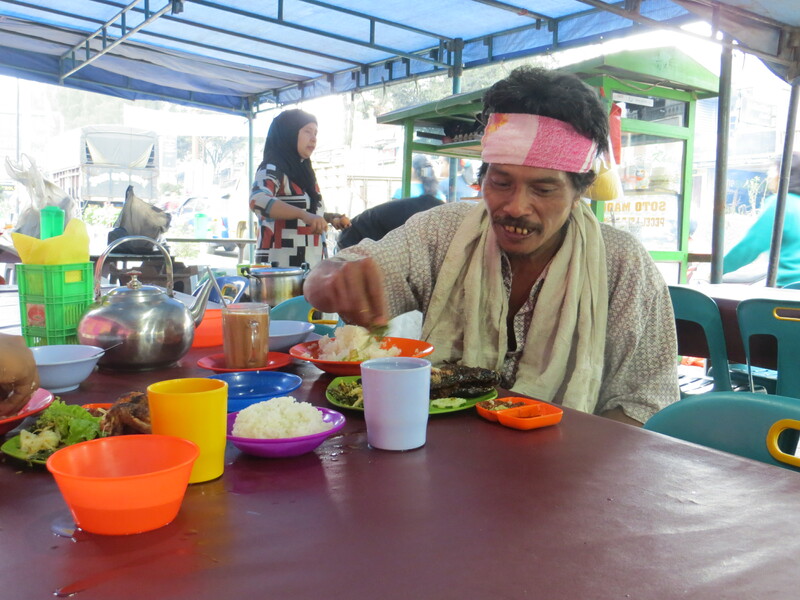 The main economic activity in Berastagi centres around its colourful fruit and vegetable market. 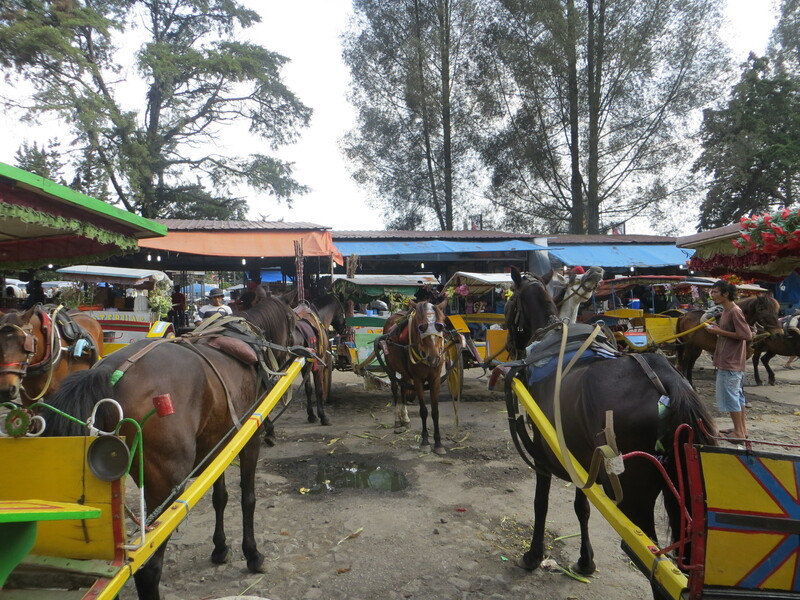 These horse and carts are essentially taxis, bringing people to and from the market. 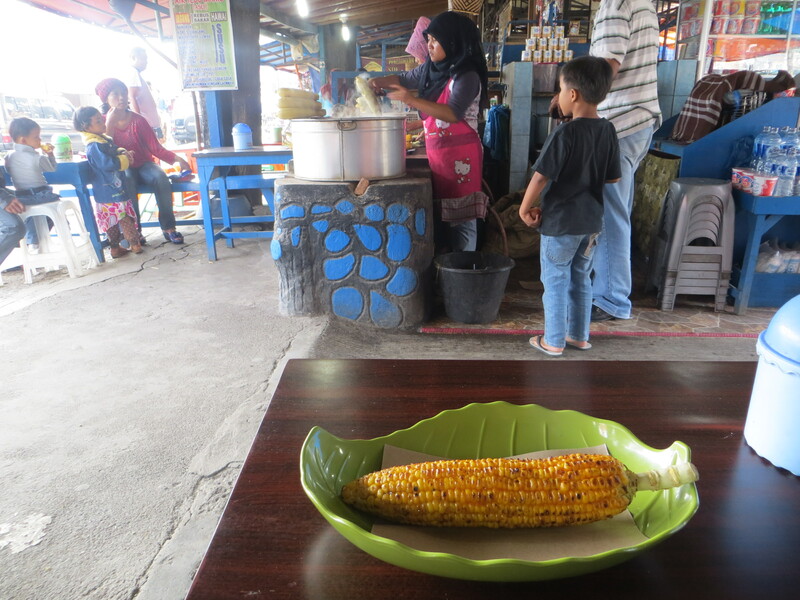 In Indonesia, grilled corn is a very popular street food. Vendors usually make a sambal paste using chillies, garlic and shallots before mixing it with butter to coat the corn. The result is sweet and spicy awesomeness. Such a good place to just sit and watch the world go by – albeit with corn stuck in your teeth. Old beat-up cars honk their way through the centre, but with a population of just under 50,000 there’s a nice vibe to the place – way moreseo than Medan which is a dirty, car-clogged mess. As always, the back streets and alleyways are where you want to explore. This woman was selling all sorts of vicious looking meat cleavers. 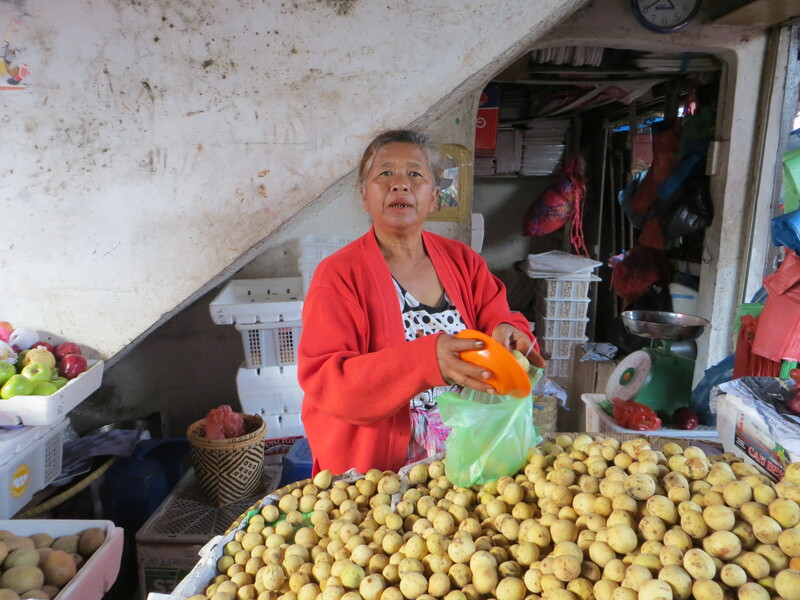 While this lady opted to sell the much less threatening potato. Cauliflower, cabbage, radish, tomatoes and carrots are all sold in abundance. I remember this meal as if it was yesterday. This guy took great delight at laughing at me while I made a mess eating with my fingers. Funny guy. The colours of the tupperware were amazing. 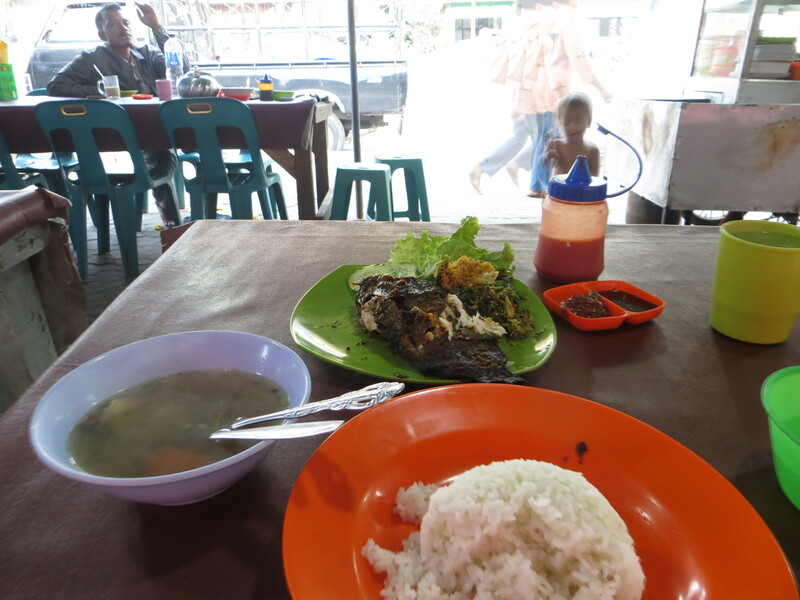 Pretty much a standard Indonesian meal: grilled chicken or fish, rice, a soup made from stock. Not forgetting a spicy sambal dip. What it lacked in appearance it made up for in taste. While others slate Berastagi, calling it a hole with nothing to do, I liked it. It’s a town that is purely Sumatran, people just going about their everyday business. If you wanna get a feel for the real Indonesia make sure you experience these towns – don’t just leave them at the earliest opportunity. Don’t forget to subscribe on the main page to get the latest from Ikimasho! mailed direct to your inbox. ← Android: What is Human? Innovations in Humanoid Robotics. The little unassuming towns can be the best. And homestays are a great way to absorb the culture, good stuff here. Would you happen to have any recommendations for homestays in Bali? Hi Ashley – I never actually stayed in any homestays in Bali, I’m sorry! But I would love to, they really are the best way to get a feel for local life. I take it you are heading there soon? Pingback: The sleepy little town of Phetchaburi, Thailand. | Ikimasho! Actually many homestays are listed on booking.com. Have a look there for starters. Also google. Cemoro Lawang in Java there are absolutely loads if you just turn up in the village too!